When I was little, the only family vacations we could afford were to state parks for camping (read: I have never been to a Disney theme park but this will be remedied in January). At these parks there were shower facilities with toilets but we slept in tents and cooked over a camp fire. 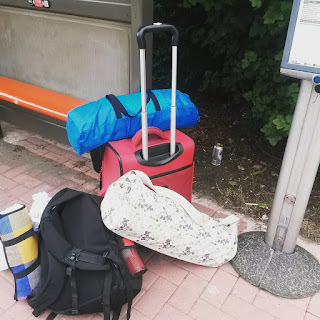 It is a running joke with my husband that I don't pee outside so in all our years together, we have never been camping (we also lack all the necessary kit). However, when my friend Helen was putting together the Spitfire Scramble (SS) relay team, I knew I had to do it. So I bought a tent and waterproofed it with NikWax for extra protection. Luckily it didn't rain, so I didn't have to truly test out the efficacy. My husband has a sleeping bag for field trips to the Atlas mountains and I have a cushiony exercise mat from Decathlon I brought to sleep on. I took a crappy pillow from the couch (wrong decision) and thought my sleeping arrangements were sorted. I signed up for the food pass offered by the organisers, but somehow I ended up bringing an entire suitcase of food. Here is a photo of all the stuff I carried on public transport. That was a workout in itself. -Triathlon belt to keep your number on- This avoids faffing if your shirt is still wet from your last lap. for the photo. Not bad for 6:30am! -Camping chairs or picnic blanket- So you have a place to sit. I vote for chair as it will be much more comfortable but it depends how much stuff you can carry. -Solotrekk Deluxe Travel Clothes Washing Line - This clothing line doesn't require pegs. One of the most ingenious inventions I have seen in a while. -Gazebo or some kind of shelter- makes it easier to find your camp from far away and helps keep you out if sun or rain. 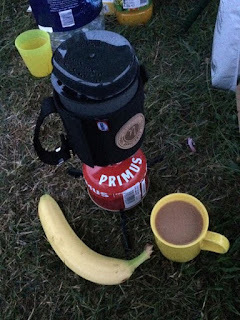 -Small camping stove- We had the Primus Lite+ which was perfect to boil water at camp for a quick cup of tea, instant porridge and a pot of noodles. It saved me a trip to the food truck for something quite simple. It took less than a minute to get 2 cups of water boiling. It also would have been perfect for the cold Saturday night if we had thought to bring a hot water bottle (which I added to this list below). Just make sure the Lite insulation cover is in the right place on the cup. We had it a bit too low and singed it a little. The fuel canister can be resealed meaning there isn't any waste and you can carry it home with you. The stoves uses ETA technology for fuel efficiency too mean the can should last a while. I recommend a light with a long nozzle to lit the pilot (only 1 click needed. Every time). -Food & drinks you can make with hot water- Save money and save your legs for running. Interior of my n+1 tent. -Hot water bottle for cold nights when your body is vasodilating- We all were shivering on Saturday night rather than sleeping. -Lots of bin bags for wet stuff and rubbish- Carry in, carry out. -Glow sticks or bracelets- Be visible in the dark, mark hazards & it is fun! -Spare head torch & batteries - This is a reminder for me as my head torch barely made it around the course. -Solar powered charger and extra power cell- Cassie brought one and it proved to be useful, when the sun was out of course (great British weather). I had an extra power cell with me and tried to keep my phone off as much as possible. -Cash for masseuse- A must on a 24 hour race or if you are running it solo. -Wine or beer- This should have been obvious to me but wasn't in the week leading up to the race. -Salty & sweet snacks (but nothing new)- To satisfy all cravings. -Spare loo roll- We never needed this as SS was well organised & stocked but I can't promise thus for every relay. -Hand sanitizer- Essential for outdoorsy stuff. -Lots of layers- The weather might be unpredictable and adding the overnight element is a game changer too. None of my clothes ever dried in time for the next lap so I think I wore everything I packed anyways. -Tent that is for n+1- This is a camping rule, regardless. -Dry bag to keep important stuff dry- Friday night it poured at camp. If I had been there, my phone, camera, Kindle, and race info would have been in my dry bag. -Reusable water bottle & then huge bottles of water (although SS provides water for free)- You just need to fill up your personal bottle. -Water for brushing teeth- No facility to do this at camp. -Towel and wet wipes- Just in case you can't find a shower. I was never able to get there due to the timing of my run shifts and when the shuttle bus was available. -Blanket to stay warm at night when you are waiting for your lap to start- Either a regular or foil blanket would be handy. Even a Snuggie would work. I am sure if you had a car with a large boot, there are a few other things you would add to the list but these are a good start. Have you ever run a relay race? What equipment was essential for you? Thank you to Primus for providing our team with the Lite plus stove to test out. And thanks to NikWax for the samples. All opinions are honest and my own. Excellent point Andrew! I had practice with my tent because of the water-proofing but I know some people on the team struggled.